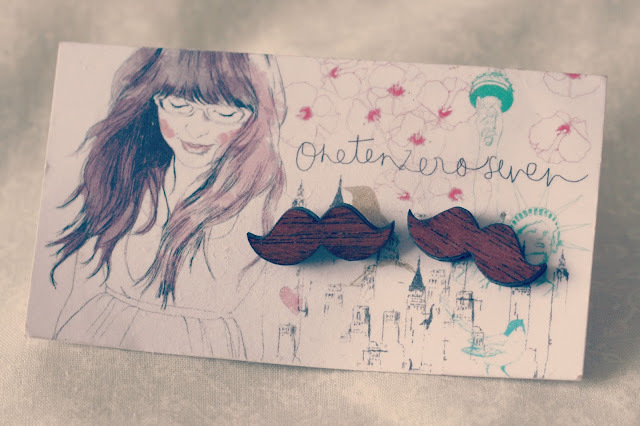 Moustache Earings - Onetenzeroseven - C/O Not on the Highstreet. Arent these little moustache earrings just adorable? I've got my ears pierced three times in each ear and often I just stick to simple studs in each hole, I'm more of a stud kinda girl over something a bit dangley! So when I saw these cute wooden earings on not on the highstreet I couldnt resist. It was a toss up between these and the tea cup ones, although I'm still tempted to get those too! 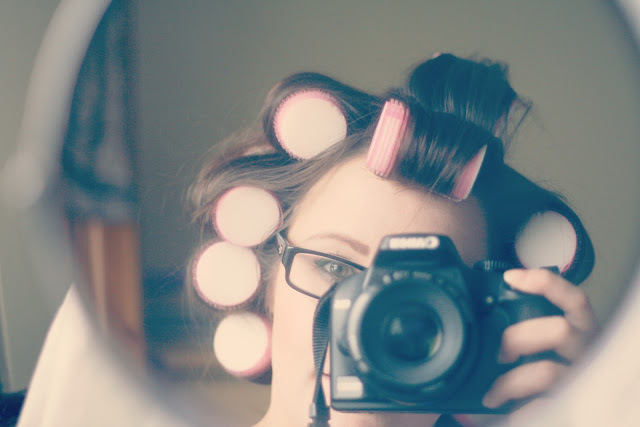 You can follow Sophies Blog here, or send her a hello tweet here. Are you one for quirky bits of jewellery or do you play it safe with something simple? 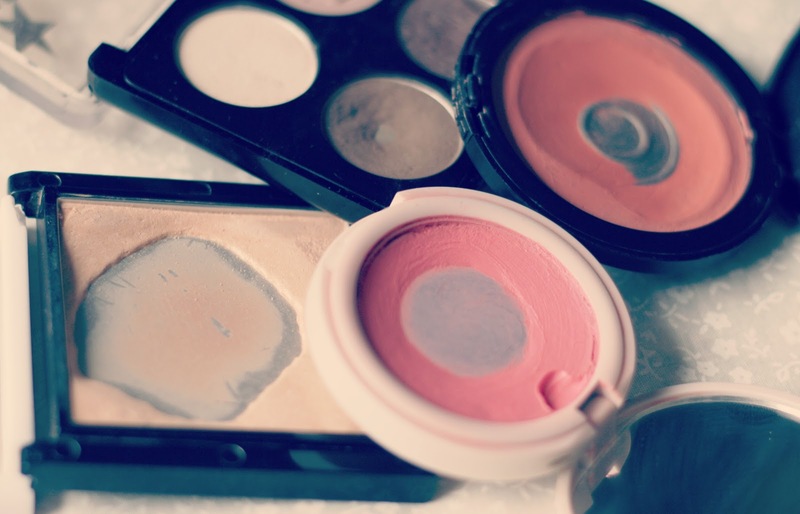 To all beauty bloggers, 'hitting pan' is a big deal to us. It proves that a) We haven't neglected certain products in our stashes, which lets be honest with the size of some of our collections its easily done and b) we've loved something so much that.. oh my god.. we are well on our way to completely using it up. Some bloggers are on spending bans, others (like myself) are switching their products in the makeup bag regularly to ensure products don't get forgotten and to eventually finish up some items. I thought I would do a little post on the products I have recently hit pan on, I wont lie, its a bit exciting when you are sat down in the mornings putting on your makeup, you look down to see that bit of silver shining back at you! A very recent product I have hit pan on, is the matte brown shade in the Soap & Glory Eyeshadow quad. After I finished my preferred shade in the HD foxy brow palette I searched for a good alternative, and this one did the trick. It's just a bog standard matte shade that matches my eyebrows, nothing more to say really! I really never thought I would ever hit pan on a blusher, Topshop's Flush was the first blusher to show the silver pan. 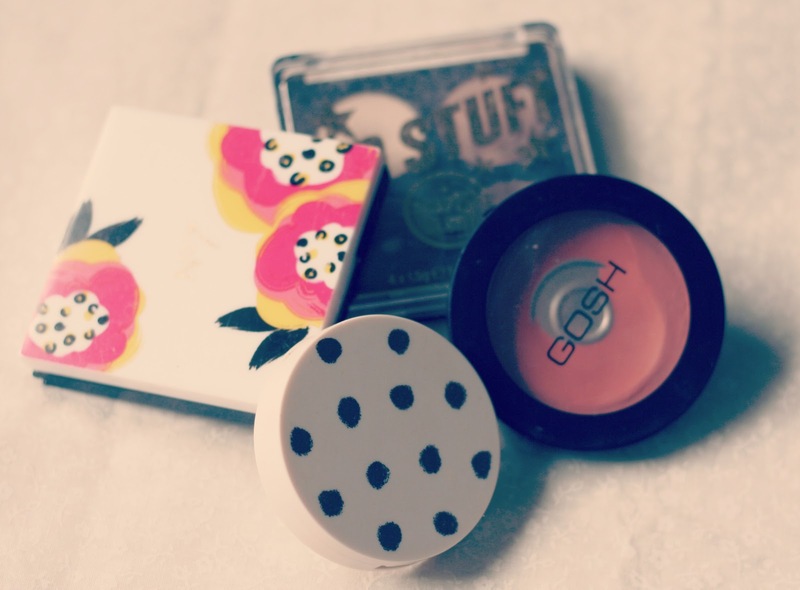 I'm a big fan of Topshop makeup products and have two other blushers in my collection (Head over heels and Neon Rose) They are really affordable and the longevity on my skin is amazing! It lasts all day! 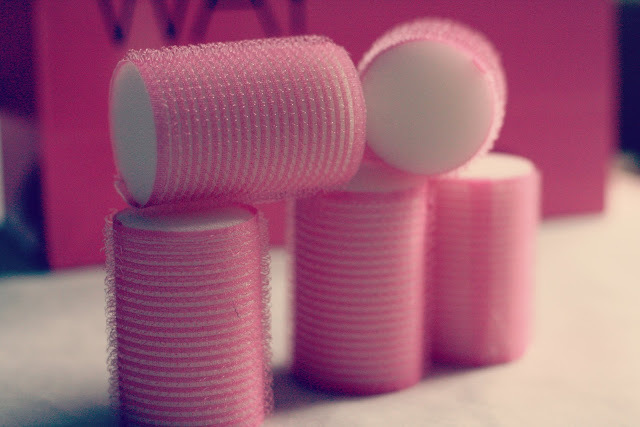 I'd own all the Topshop Cream Blushes if I could! The other blush is one I have had for a while, it is from GOSH, I don't actually know the name of it thanks to Superdrugs annoying packaging but I think it is called nectarine or something like that! I wouldn't say it was one of my favourite blushers but it has good pigmentation and its a beautiful coral shade. I don't think I will be hitting pan on any makeup products for a while, but I'm pleased with these four items for now! Have you hit pan on anything recently? Let me know in the comments, or perhaps do a blog post similar to this! I admit, there are a fair share of lovey dovey Valentines themed blog posts floating around at the moment, don't worry this isn't a post declaring my love to Tom and banging on about V day! However it is a little post about capturing memories - (Gosh that sounds a bit deep doesn't it, I promise it isn't like that!) Some people make Valentines this big thing, by going out to dinner, take a break away somewhere 'Romantic', showering each other with gifts and such. Yes this is nice, however being in a long term relationship I don't get too phased about the 14th anymore. I'd rather receive a card or bunch of flowers on a day that isn't expected. Or even go on a trip away for a mini break with my man at some point in the year. Some of you might be aware that a few years ago Tom and I went to New Zealand travelling, things didn't plan out as we hoped so we didn't stay as long as we intended, however we did get to spend an AMAZING 3 months there (both Islands) travelling around taking in the sights. Just soaking up everything New Zealand had to offer really! It made us realise that taking the time to go on trips away, whether it be on the other side of the world, in Europe or weekend trips within the UK is good for us. Something I feel everyone should take the time to try to do when in a relationship. It's great to discover new places and spend some time with the person you love. For my birthday a year or so ago, the sneaky so and so; Tom, went through the hundreds of photographs we took while in NZ and put them all together in a photo book (I think he got it from Vistaprint - Vistaprint also do things like personalised birthday cards, thank you cards, calendars etc) He selected the photographs, adjusted the sizes, decided on the composition of each page. He put A LOT of work into it. It was a complete shock to me and couldn't believe how much time and thought he had put into this fantastic birthday gift for me! It was so nice to sit down and go through it with him. Laughing about some of the not so nice places we stayed, the activities we got up to (we were at the football match when NZ qualified for the World cup. That was amazing!) Now if half of my belongings weren't packed away in the garage I would have some photos of said book, so sorry about that, but if anyone is interested I can take some when I dig it out when we move into our own place again! But as I am so lovely I put together the above collages of just a handful places we have visited! I guess what I am trying to say is remember to make the time to do some fun things in your life and document them. These moments don't have to be with our other half, they could be with friends or family. Just take the photos, keep the tickets, the reciepts and that funny beer mat you found in a random bar where you got stupidly drunk, and treasure those memories. It's always fun to look back on them and reminisce! Once the wedding is all sorted and the honeymoon has come to an end I want to sit down and go through our photos and create some more photobooks of our city breaks we've been on in the past year! The modern day version of the photo album! I've got to the stage where I'm not really making that much of an effort to finish skincare and haircare items at the moment. My main focus recently is on makeup. Realising I own far too much for my one face, 2013 will be the year I actually finish makeup items and at least attempt to downsize my collection. (I've already started by downsizing my nail varnish collection, You can read how I did this here) There I'm pretty darn pleased with myself that this post includes 4 make up items! More on that later though, first we'll talk about the skincare. Another of my 'Goals' I set myself for 2013 was to moisturise more. Yes I am one of those girls that to be honest... just cannot be bothered with the faff of moisturising! With that being said, I have a LOAD of mositurisers begging to be finished, and with my new goal in place, I set to work trying to finish a lotion or two. In this case I used up my Bath & Bodyworks Sea Island Cotton body cream. Unfortunately, we cannot get B&BW products here (Unless you purchase bath and bodyworks stock from this Ebay seller)This had a lovely fresh scent that lasted all day, it didn't take too long to sink into my skin, maybe a little longer than I liked but overall it was a good moisturiser to use. I actually have another tube of it which I am cracking on with now! One tube of moisturiser down.... tons more to go! Sadly I also recently finished my Caudalie SOS Thirst quenching serum. I sang its praises back in this review, so I truely am gutted that I finished it! Due to seriously cracking down on my spending at the moment I am not repurchasing it yet. Instead I have bought the Body Shop Vitamin E Moisture serum for a more affordable price (on sale for a fiver when I bought it) to see how it compares. 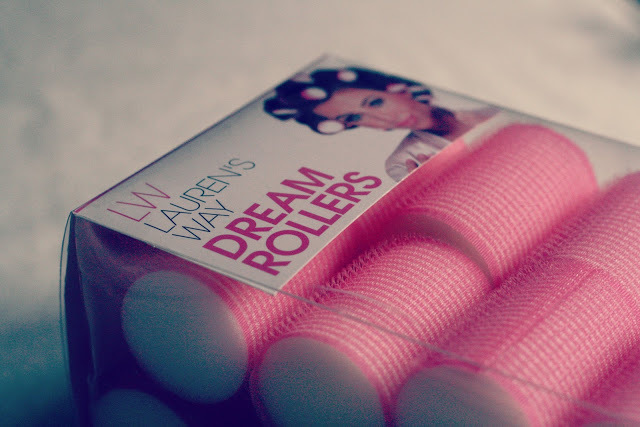 I will be putting a review up on the blog once I've used it for a while. Now onto the finished make-up items. I know there's nothing groundbreaking about finishing foundations but the fact that I finished these two makes me happy. I want to go back to only owning 2 foundations.. One for my normal skin tone and then another for when I decide to dabble in a bit of fake tan! Estee Lauder Double Wear is a big favourite of mine, the coverage is great the only downside is the SPF! Ghost face! Bourjois Healthy Mix has been a favourite foundation of mine for a while too. It doesnt feel heavy on the skin, gives good coverage and the shade 52 is a perfect match for my natural skin tone, I've repurchased many times! 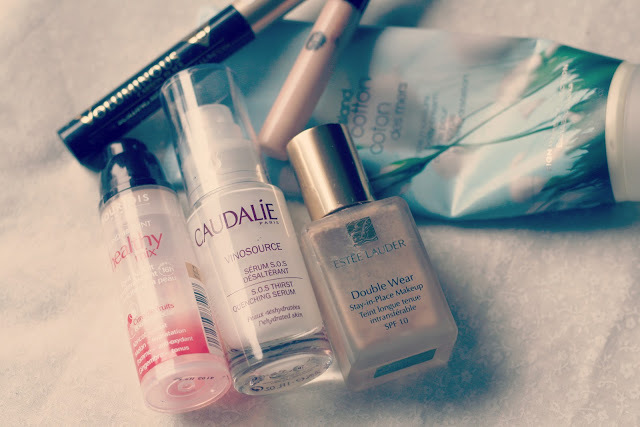 Speaking of favourites (or staple products in my make up collection) Collection lasting perfection concealer and Loreal Voluminous mascara are two of my all time favourite products. Everyone raves about the concealer with good reason too, as I find it perfect for covering up all those inperfections, and keeps them covered all day! Loreal Voluminous makes my lashes look so long and full, I've used this particular one for years, even though I do love it I am looking to try out some other mascaras just to switch it up a bit. There are a lot of multiple items in my makeup collection, however when it comes down to mascara and concealer I only ever have one of each within my entire collection. I'm pretty chuffed to be able to say that! I know a lot of people have large stashes of both! So there you have it, some of the products I finished up recently, If you've done an empties post link it in the comments and I'll come have a read! With a few makeup storage posts popping up on my dashboard it got me thinking about my own collection. I currently house my makeup items in 2 sets of acrylic drawers and my haircare/skincare in old glossyboxes. But I'm just bored, bored of the acrylic storage and the plain glossyboxes and am thinking about switching it all up for something different. You know I am in the process of downsizing my collection so with that I'd like to completely refresh the way I store it all! I've been looking online at Amara and I've discovered a few gems that I thought were worth sharing with you guys. Pantone Storage box | Cake Stand | Stelton Stackable Storage. Firstly, how quirky are these Pantone tins, I thought they would be a great solution for my skincare or haircare items. I would probably need more than one with my current collection, but with 'keeping things hidden' in mind I thought they would be a cute addition to my bathroom. Rather than having everything spilling out of Glossyboxes! I thought they were a bit different to your usual storage options. I think the bright colours would work really well against the white canvas of my bathroom interior. After seeing Sarahs post on how she stores her everyday essentials I've been looking out for a cute cake stand that could possibly house all mine! Sometimes It's nice to have your most loved or everyday products close to hand so a stand like this would be perfect on your bedside table. This Pip Studio one comes in three different colours but this was the most neutral style of the 3. Pip Studio do a whole range of floral Cath Kidston-esque goodies so if that's the sort of thing you are into I suggest you check them out. Finally we come to what I think are my favourite choice out of the three and that is the Stelton Stackable storage. Firstly, they give that minimalistic kind of feel that acrylic storage does, but its all hidden away. I love how you can purchase different sized pots and stack them whatever way you find suitable! I do think these are actually to use in your kitchen (which of course you could do) but if you like minimal, discreet storage I think these are a really good idea! I'm actually so tempted to purchase a couple once I downsize my collection a little bit, and hopefully get a dressing table! The smaller pots would be perfect to hold kirby grips, or earrings as well. So it could double up as storage for some jewellery items really! Something a bit different isn't it! What do you use to house your makeup collection? Are you part of the Acrylic posse, or have you broken from the 'norm' and decided to choose something different? Let me know in the comments, and if you have done a post on your collection, Link me! 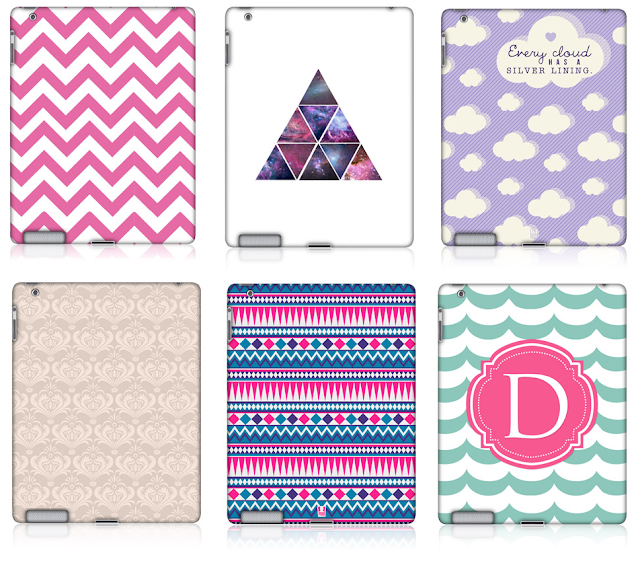 One of the first thoughts that ran through my head when I was gifted an I pad from my boss was "What case shall I get?" Such a hard dilema we face these days, personalising our gadgets! I'm constantly on the search for a new case for my phone - To be honest I'm surprised I haven't changed my ice cream drip one for something different by now! I currently have a faux leather case for my I pad, which I admit it does do the job and keep my I pad protected and doubles up as a handy stand, however I cant help but lust over the hard case covers. The downside to these are that they only protect the back of your tablet and you have to prop it up against something if you want to multitask and say.. do the washing up while watching the most recent epsiode of Africa. :-) How can I resist the cute designs though? Above are just a few that I have found while looking for something pretty, my dilemma now is that I cant decide what one I want! At £6.95 each (with the exception of the Aztec one which is a little bit more at £7.39) I guess you could say it would be okay to pick out more than one.. which is something I may do...if I could narrow it down! Having a browse on the Ebay sellers shop, I've noticed they do a variety of phone covers, some of which match these I pad cases... Do I dare go all out and have everything matching? Which is your favourite? Help me decide! Are you like me and cant stick with the same case or cover for more than a few months?